Beauty Blog by Angela Woodward: How can I Re-Hydrate Dry Hair? The question I got last night said "You have a post about how to fight greasy hair, but what about if you need a few more natural oils? My hair is super dry, and I want to know what products I should be using to help re-hydrate my hair." The question was asked, and it will now be answered. 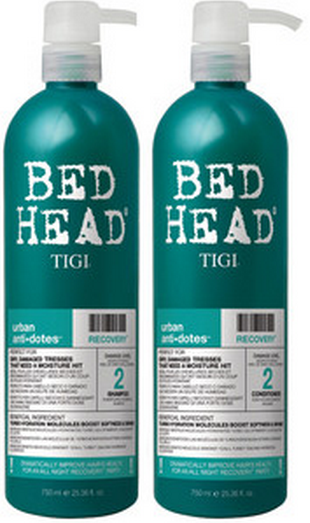 The best hydrating shampoo is TIGI Bed Head Recovery. This shampoo and conditioner focuses on hydrating dry and lifeless locks. It smells amazing (Like all TIGI product) and it works wonders! Another option is Paul Mitchell's Tee Tree Oil shampoos. These are best if you have a dry or itchy scalp as well, and are great for fighting dandruff as well as re-hydrtaing your hair. However don't use the Tee Tree Oil Shampoo if you have colored hair. For colored hair go with Redken Sulfate Free Color Magnetics Shampoo and Conditioner. Where I live, it is dry all year round, but especially in the winter. So I do this Ultimate Hair Cleanse every other month! It is a two week process that allows your hair to absorb all of it's natural oils and conditioners in a healthy way! It does tons of wonderful things for your scalp and hair. Here is a link to learn all about it, and get a step-by-step guide on how to do it! For leave in conditioners I love Redken Frizz Dismiss Leave-Ins. They have two I recommend. Rebel Tame for thick, curly, and unruly hair, and Smooth Force which is a spray leave in conditioner for other hair types. The are light weight, smell like warm towels, and they hydrate while banishing frizz! Nothing kills or dries out your hair more than hot tools without heat protectant! The two I will suggest here are TIGI Straighten Out (which is a heat protecting lotion that works for blow drying and flat ironing hair, and doubles as a leave in conditioner) and Redken Iron Shape, which is best for curling or flat ironing hair, but will need a leave in conditioner as a companion. If you are looking for something just for blow drying your hair I love the SatinWear by Redken. If you are not having any luck with a leave in conditioner, try a moisturizing spray, which is more lightweight than any leave in conditioner, and it doesn't add shine. The only one that I have liked is TIGI S Factor Papaya Leave in Moisturizing Spray. The difference between a leave in conditioning spray and moisturizing spray, Is a leave in is traditionally done on damp hair, and s often to heavy for hair when it is dry. Moisture spray is super light weight and is used on dry hair only. To buy most of these product click here!